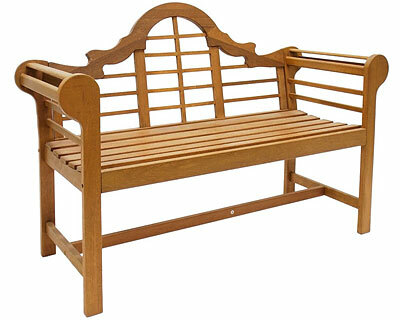 Add a touch of famous architecture to your garden with the Achla Wooden Lutyens Bench. Based on a classic furniture design from British architect Edwin Lutyens, this bench will certainly create a wonderful focal point and resting spot in your garden. The sustainably harvested, hardwood construction forms a durable bench, while its tan color furthers its natural appeal. A striking arch brings height to this piece, its apex forming the center of the bench back. Gentle curves direct attention softly downward from this pinnacle, and rolled arms on either side complete the effect. Wooden slats form a grid pattern beneath this arch, offering both support and contrast to the bench. The 47.75" long and 15.25" deep seat extends from this back, and the slats here curve slightly downward to create a comfortable and usable bench. The two, 29" long side panels flank the seat and form the legs, for situating the item on virtually any level surface, and support bars between each leg add strength to the piece. The included hardware makes assembly simple, while the seat width is perfect for one or two people. Its wooden construction withstands seasons of use, and its tan hue remains lovely indoors or outside. Bring comfortable seating and familiar style to your backyard using this Wooden Lutyens Bench. Assembly required.